We’re on a mission to figure out just what conscious leadership is and how it shows up in our businesses. In other words, what does “conscious leadership” look, feel, act and sound like? In the southwest New Hampshire town of Gilsum, down a quiet road flanked by woods, there is a humble sign marking the entrance to W.S Badger, one of Forbes magazine’s 2017 Best Small Companies and New Hampshire’s first B Corporation. We met with the newly appointed co-CEOs, or Collaborative Executive Officers, Emily Scherwin-Whyte and Rebecca Hamilton, daughters of W.S. Badger’s founder, Bill Whyte, and chief operating officer, Katie Schwerin. With about 100 employees, W.S. Badger generates all-natural body and skin products through the entire process: from research and product development to manufacturing to customer service. Badger makes its mark not just in how it produces revenue but in how it literally feeds its employees and surrounding community while creating demand for ingredients grown from planet-friendly, agricultural practices. So what is conscious leadership to Emily and Rebecca? It’s about having an intentional and consistent focus on the personnel, which shows up in their approach to developing new products. Rebecca recounted that Badger’s Chest Rub went through its inception with the goal of helping her, and those like her, who deal with frequent sinus infections. With over 100 items in their catalogue, all have been conceived from a real-life need expressed by a customer or employee. As such, each product has a champion whose job it is to make sure that the vision of seeing that person use the product to “soothe, heal and protect” is fulfilled. One of the most significant guiding principles cited by both sisters is to use “kindness as your compass.” In other words, when the world stage looks dark and depressing, they believe that rather than being paralyzed by fear, those dark moments are the opportunities for kindness and compassion to emerge. With a commercial kitchen onsite, the company provides organic and locally sourced lunches for all employees, five days a week. Emily noted that by sitting down with each other for a daily meal, “we see each other as equals and have a connection outside of work,” which makes it easier to find a pathway for solving disagreements. To create a sustainable culture of kindness where people not only want to come to work but also grow their careers, requires a systems-thinking approach. The best way to cultivate compassion and respect is to be able to walk in another person’s shoes. At Badger, that perspective-taking starts with the onboarding process, when all new Badger employees work a period of time across each department to understand all the pieces of the puzzle. The benefits are that when one department gets overloaded, others are well-equipped to step in and help. As the company has grown since its inception in 1995, leading from the stance of nourishing people, community and the planet has been an ever-present touchstone to guide decisions. A few years ago, Badger became a B Corp., which requires an assessment of how an organization “does well by doing good” in regard to transparency, accountability and performance. The sisters said that by diving deeper into the mission, values and behavior, they gained a better understanding of how it applies presently and for future generations. It’s clear that Badger has made it a practice to crack open old paradigms, seeing a strong correlation between prioritizing the well-being of their people and long-term profit bearing. Within their philosophy blooms the evolution of business and a path to feed the soul. 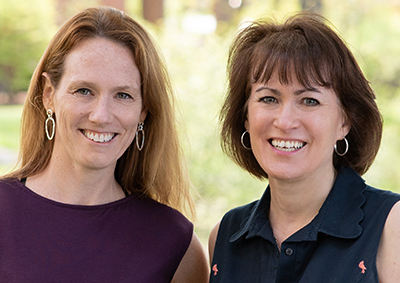 Deb LeClair and Trinnie Houghton, executive coaches and senior facilitators specializing in conscious leadership development, can be reached at debl@sojournpartners.com and trinnie@sojournpartners.com.